We Got A 5 Pack Of Shopkins Season 5! 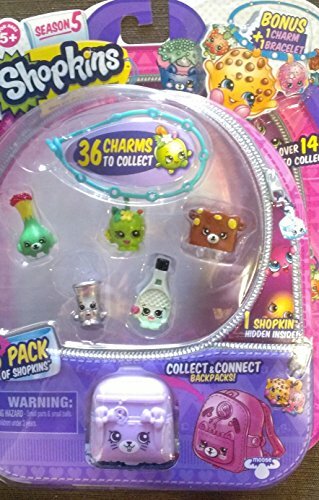 We Got The 5 Pack Of Shopkins Season 5 With The Bonus Charm Bracelet! 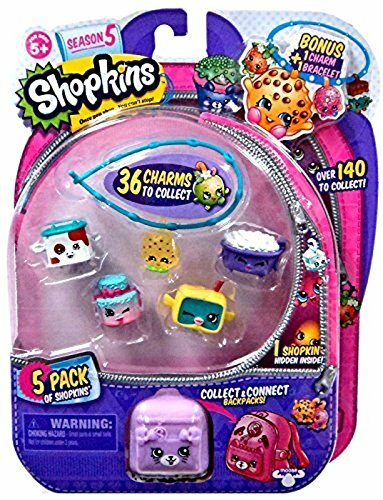 We bought a 5 pack of Shopkins Season 5 that came with the bonus charm bracelet as well as a Petkin backpack as a gift for my niece . This Shopkins 5 pack is super cute and my niece was thrilled! You can see that there is 4 Shopkins showing and one little Shopkins charm in the packaging. There is also one hidden Shopkins inside the Petkin backpack! The Shopkins figures that come with this pack are so adorable as well as the little charm Shopkins that goes onto the bracelet. Let’s take a closer look at these cute Shopkins Season 5 figures below. In A Hurry? ====> Buy A Shopkins Season 5 Pack Of 5 Here! Once we opened the Shopkins 5 pack we placed what was inside on the table for pictures. There were 4 Shopkins figures, Polly Piano, Polly Teapot, Tasty Toast, and Dennis Bat. There also was one Petkin Backpack with a string attached to the side of it. 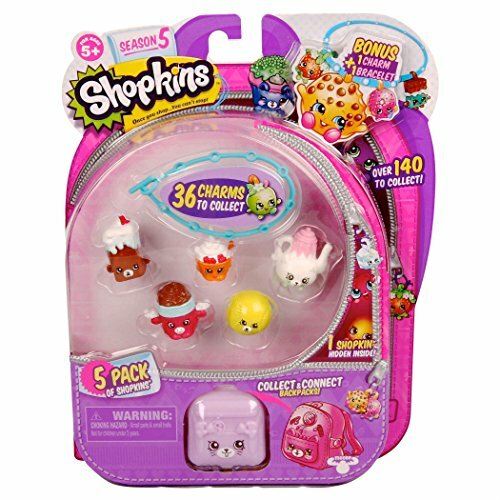 Inside of the Petkin Backpack was a hidden Shopkins figure which we will show you below. This 5 pack of Shopkins Season 5 also came with a bracelet and one charm! The charm was Strawberry Kiss! Which was great because strawberries are my niece’s favorite fruit to eat. There are 36 assorted charms to collect in all and looking at the chart of charms to collect they are super cute! 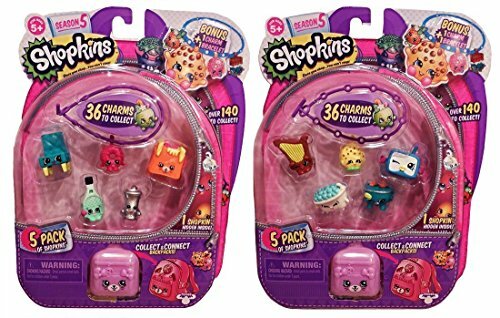 You can buy the Shopkins Season 5 5 packs as just a single pack or you can buy them as a 2 pack deal. I’m not sure if it’a a better deal or not it would just depend on whether or not you can get them on sale. This is not the exact 5 pack that we bought as there are many different 5 packs to choose from. You can also see that you get a different color of bracelet in each pack as well as a different charm for your bracelet. My niece has her eye on the little cookie charm next. She says that it is so cute and would look nice hanging next to her little strawberry charm! Polly Teapot was part of the 5 pack set that we bought. Polly Teapot is from the homewares category. Isn’t she adorable? Gotta love her little mouse face. Polly Teapot is common Shopkins Season 5 figure. This is Dennis Bat who was also part of our Shopkins 5 pack set. Dennis Bat is from the sports category. He is a common Shopkins season 5 figure. This is Creamy Cookie Cupcake. Doesn’t she look yummy! Creamy Cookie Cupcake was our hidden Season 5 Shopkins. She was hiding inside the Petkin backpack. Creamy Cookie Cupcake is from the bakery category and is a rare Shopkins figure. Buy a 5 Pack Of Shopkins Season 5 Online! Here are more adorable Shopkins Season 5 5 packs to choose from. Remember there are 36 charms to collect for the charm bracelets. We buy alot of our Shopkins toys online from Amazon. It is more convenient for us and there is usually more selections to choose from. We bought the Shopkins Kinstructions Fashion Boutique online and we received it quite quickly.